I was a little sad to see my mini vacation over. I thought I would start with this little faux fur jacket. The colors are rich and perfect for a chilly cold day. I knew I had to have it. and well you know my love for pockets. is that tell a story. knew it would fall into my hands. I've worn it more than 4 times. I've only had it for a week. who owned the clothes before. What is this jackets story? Where have you twirled or kept someone warm? well it is just as lovely! So tell me do you own any pieces that tell a story? I love that MK satchel! Your coat is gorgeous too! Abby thanks so much lady :) It gets used way more than I thought it would and I love that its navy! You look super stunning. I love the coat! Thanks lady :) I really do love this show stopper! LOVE that purse! And especially how you tied it into the coat with the Pom. So cute! Sarah! I was torn in actually doing that then I realized meh it looked cute :) Glad you noticed that! What a fabulous jacket!! And on sale even!! Nice find!! Umm, can we just say killing it! Love that coat -- it is amazing! And even the little pom-poms on your purse! You're a girl after my own heart! Audrey thanks lady! I love that coat and well I was happy I added the pom poms too!! The coat is stunning, love the look and the pictures! Cute outfit and such a fun coat! Happy 2016! Gorgeous, fabulous and fun! I love this look! Thank you!! I love when you can be fun with your wardrobe! This look is gorgeous!! And I'm loving those boots. Yes! Love that about vintage shopping, you never know where it came from or if it was just meant to end up with you. Looking great, lady - happy 2016! Karly thanks so much I need to go more than I do because you really do find unique pieces! Happy 2016! I am so into faux fur pieces - this is so chic! I actually love real fur so so much, but for full jackets the price tag is just way too high! Love this look of this one! Ellese thanks so much because trust me when I say you can never go wrong with a great faux fur coat! Love this look! 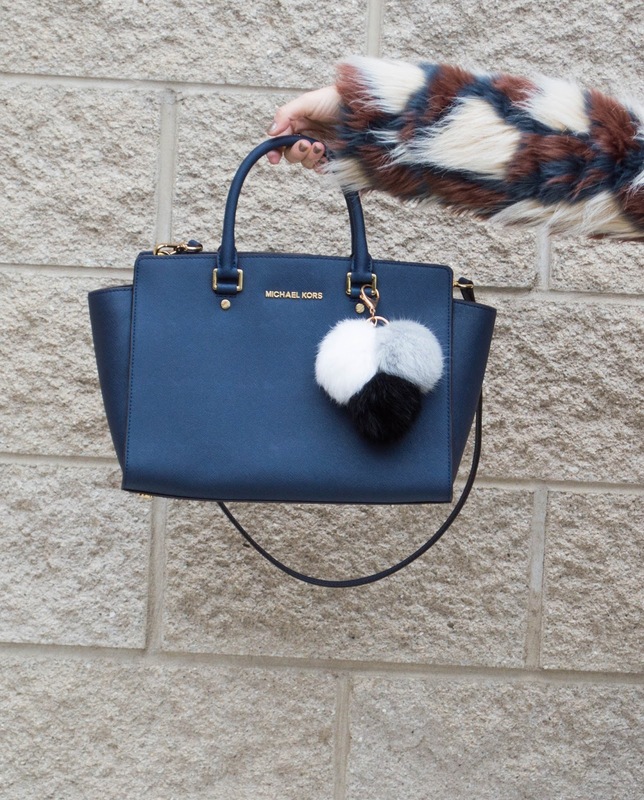 The faux fur is too cute! Happy New year! Jeanie Happy New Year I love this coat and need to retire it for a week!! You are a babe with all your fur pieces and accessories! That coat is pure PERFECTION!! This jacket is ACE, girlfriend! What a fun jacket! Love yiur bag too! With every post you step up your outerwear game! I SERIOUSLY NEED TO GET ON YOUR LEVEL. I've never needed so many layers before moving to Chicago, so I have a lot of catching up to do. That jacket is seriously so fun! I love the colors and shape of it for this time of year. Love it! This jacket is such a great find! It looks so chic and trendy! Such a gorgeous look. Those shoes are so stunning!! Love this look on you, casual yet chic! Plus your jacket is to die for! I so love your coat! I want one too! =) So fab!!! What a great jacket! It was such a fab find! nice look, love the jacket! Wow, you are so beautiful, this coat is amazing!